You'll find no greater example of the can-do spirit of two local members of the Greatest Generation, Robert and Marjorie Lundegard. These sensational seniors have spent their golden years volunteering and spearheading preservaton fundraising effort at Colvin Run Mill so that future generations can learn from yesterday's innovation. "Children should learn things from the past before we had smart phones and learn the history and technology of a different era," said Robert Lundegard, a retired federal government science and technology expert who also taught at Syracuse University. "This mill is water-powered and is capable of producing 50 barrels of flour per day when runing at full power. It was 'the' technology up until after the Civil War, when electricity and wind power were developed." Marjorie Lundegard, a retired Oakton High School chemistry teacher, started volunteering at the mill in 1988. Her teaching experience has come in handy with visiting school groups. "We use the mill for 3rd grade science field trips connected to simple machines," she said. "It's rewarding to feel that you somehow played a small part in the educaiton of students. Sometimes, we get letters back from the kids thanking us for the experience." Over the years, the Lundegards identified other ways they could help. 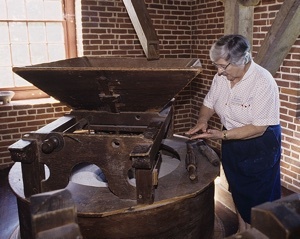 They were among the first members of the Friends of Colvin Run Mill when it formed in 1997. Robert, a former president, says the Friends group raised money for lights, "so you can see the mill at night," and a portable mill called a meadows mill for demonstrations. "We got so many requests to demonstrate milling at other sites, we then had to buy a tractor trailer to move the portable mill, which rounds on electricity or can run with a gas engine, which makes noise so it attracts a crowd." 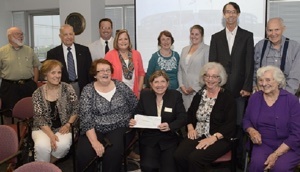 Public awareness is part of their historic preservation fundraising strategy. 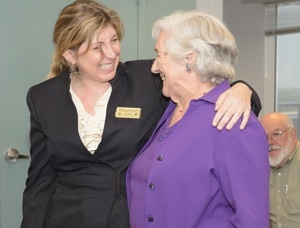 With a campaign reminiscent of WWII home-front activities, Marjorie enlisted the community's help in supporting the cause. "We started on a small scale selling things that were in our closet," she recalled. "Then we put notice in the newsletter encouraging people to donate things that could be sold on consignment in a shop in McLean, and we received 50 percent of the proceeds." Marjorie also used her love of history to generate revenue for the mill by writing, publishing and selling more than a dozen books about mills in the region. 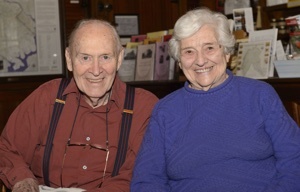 In 15 years, the Lundegards' efforts helped generate the impressive sum of $50,000 to support Colvin Run Mill's capital improvements plan, which includes renovating the miller's house and building an educational visitor center, and they continue to support the cause with the same can-do spirit that started their campaign. Together, they and the Friends group have proven that a penny saved is indeed a dollar earned.